Cicely Fleming (9th) is sworn into office at a meeting on Monday. Fleming said she believes there is historic diversity in city government this year. As Evanston’s new City Council and district school boards begin their terms, some officials have pointed to the historic racial diversity in all three bodies. According to several elected officials, for the first time in recent memory, two women of color are leading the Evanston/Skokie School District 65 school board as president and vice president. Suni Kartha and Anya Tanyavutti were elected earlier this month as president and vice president of the District 65 board. In addition, the Evanston Township High School/District 202 school board is also currently led by two women of color, president Pat Savage-Williams and vice president Monique Parsons. Savage-Williams became president in 2015 and Parsons became vice president last year. Kartha, Savage-Williams and Ald. 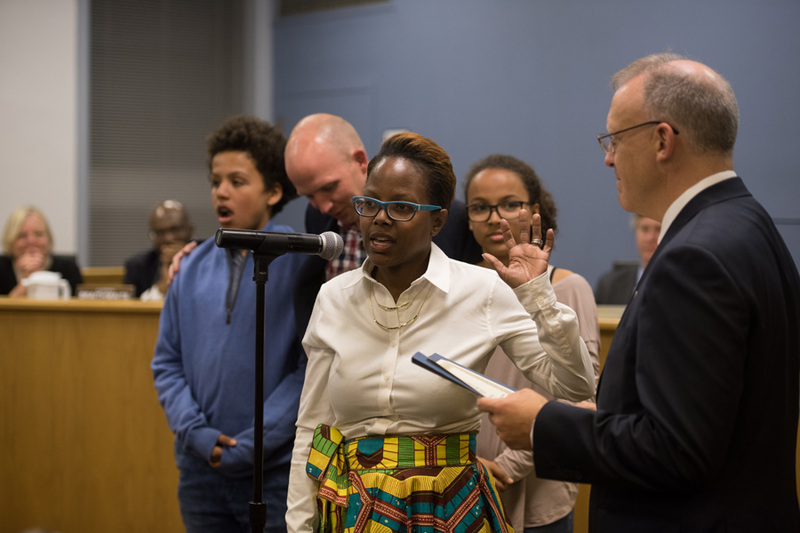 Cicely Fleming (9th) — who was sworn in Monday along with other members of the 80th City Council — said they believe this is the first time in Evanston’s history that four women of color are simultaneously leading the city’s two school district boards. Fleming said she has been working with Dino Robinson — founder of Shorefront Legacy, a nonprofit that documents black history on the North Shore — on researching past records to see if the new City Council has a historical number of people of color. The new City Council has three black aldermen — Ald. Peter Braithwaite (2nd), Ald. Robin Rue Simmons (5th) and Fleming — along with new city clerk Devon Reid, who is also black. Though her research is not yet complete, Fleming said she may be the first African-American alderman to represent a ward other than the 2nd or 5th Wards. Evanston’s nine-member City Council now features six female aldermen: Fleming, Simmons, Ald. Judy Fiske (1st), Ald. Melissa Wynne (3rd), Ald. Eleanor Revelle (7th) and Ald. Ann Rainey (8th). The seven-member District 65 school board has four people of color — Kartha, Tanyavutti, Omar Brown and Sergio Hernandez. And the seven-member District 202 school board has three members of color: Savage-Williams, Parsons and Jude Laude. Kartha said although Evanston is known for its diversity, merely having a diverse population is “not sufficient.” She said having elected officials reflect the diversity of the city is needed, adding that the community has embraced the importance of this over the years. The makeup of the new City Council and school boards further highlights this point, Kartha said. “I want to be a bridge between the (school board) and the Latino community, and also be there to address the unique needs of Latino students in Evanston,” Hernandez said. Hernandez added that he will not focus on Latinx students alone, but also on ensuring that all students succeed. “Overall, my big commitment is for all students to have equitable outcomes,” he said. Elected officials across the city said they believe the diversity of Evanston’s different governing bodies highlights its strength and uniqueness.